This article was originally published in November of 2014, but I felt led to re-publish in order to stress the benefits of preparedness. Preparedness isn’t just for “zombie apocalypse” type of situations, but can help us to weather personal basic emergencies well too. Greetings, friends! Later in the week I’ll have another post on organization, but today I wanted to share a post that my new friend Lance wrote for us. As regular readers know, I’m a huge believer in preparedness. Lance is too: he and his wife not only have a six month emergency fund, but a six month food storage supply as well. Lance was generous enough to share with The Frugal Farmer readers today about the hows and whys of his stellar food storage system. Welcome, Lance! 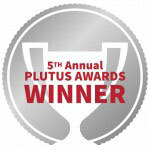 Thanks to Laurie for the invitation to write on The Frugal Farmer. What a cool opportunity after leaving a short comment the other day on one of her articles. That turned in to several wonderful e-mails and the opportunity to share a little about us and how we prepare for the future. I know my wife has dreamed of us sharing pictures of our garage and basement with people all across the world, sorry honey 🙂 . I really should have cleaned things up first! Be Prepared Be prepared isn’t just something I said in scouts growing up, it was a way of life. Most of us think of being prepared as having money for an emergency for a medical situation or whenthe car breaks down. That is fantastic and absolutely necessary. My family also stores up food for the long-term. What is long-term is six months at the moment; at least that is my guess, luckily haven’t had to test it out. This is the way I was raised (Mormon) and I was raised to be prepared for life: education, finances, food, physical health, gardening, emergency preparedness and more. You Store Up How Much Food? What the…? I know there is a general negative connotation for people that save up large amounts of food. “They must be in a cult.” “You are wasting food.” “You must be really smart and good looking.” Okay maybe not that last one, but let’s just start spreading that around because it’s totally true ;-). To be honest when we were storing up food for the long-term when I was a kid, my general thought was it was for a type of “end of the world scenario.” But that was a misperception and in reality church leaders have come out during the recent downturn in the economy and said that the reason to have food on hand was for emergencies such as losing a job or a sudden drop in income. We weren’t supposed to be preparing for the end…we were supposed to be preparing for life, which has constant ups and downs. It Won’t Happen to Me When there is a natural disaster, guess what happens to the local stores: they get wiped out immediately of their food and water. That is if you can even reach the stores during a disaster. In the last decade where I live there was a snowstorm that shut down the main road. People had to be pulled out of cars stuck on the highway and teenagers and children were cut off and home alone after school while some parents were gone to work. A lot of families were separated and couldn’t get home until the next day. 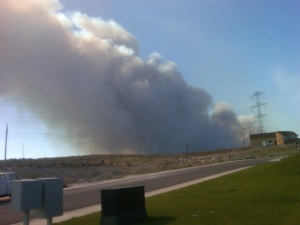 We’ve had a fire on two mountains around us that forced evacuations of part of the city. One fire was started by lighting and the other was started by the National Guard doing training drills (whoops!). What would you do if you had to suddenly evacuate your home? Where would you go? What would you do? Do you have an emergency family plan? Do you have cash on hand for immediate expenses if the power goes down and you can’t use a card? The fire looked pretty bad but it was about 7 miles away and we didn’t have to evacuate. We actually went to our neighborhood pool and enjoyed the day and watched the fire and smoke. No panic. This time. Just a few weeks ago there was a break-in at the city water supply and just to be safe the city recommended that people not use their water for 24 hours until test results came back. No big deal to us because we have months of water on hand, but guess what, every single grocery store in our city, the next city over, and the city next to that got completely wiped out of their water supply. That was for just a 24-hour scare. The impact was felt all over the place because people freaked out! That was the reaction in a place where we are taught from birth to be prepared, what would happen in your city? The water turned out to be fine after testing…but just think how much you use water and if it suddenly was unavailable. You can’t shower, wash dishes, drink (water that is 🙂 ), use it to cook, brush your teeth, or wash your hands…nothing. I forgot on brushing my teeth and had to chuck my toothbrush just in case…ugh and it was fairly new. Do you sleep better when your finances are in place? Me too. I also sleep better knowing I have back up water, food, and ways to cook if the power is gone as well. When you are going through an emergency situation you just don’t think clearly sometimes. You are so frantic that you can’t remember all that needs to be done…plus how do you know when a disaster will happen? You need to be prepared before you have a disaster… it is too late once it happens. So here is what a section of our basement looks like. We picked up all the shelves thanks to my wife’s business shutting down an office to consolidate two locations in to one. They had tons of leftover office furniture that they told employees to take what we wanted because they didn’t want to deal with it. We took all the shelves for free… my favorite price! Notice that the food in our storage isn’t weird, strange, and dried up stuff. It is actual real food. We buy food that we normally eat, but twice a year we just buy a lot more of it than usual. It’s not that much more money, it is an extra $150 for each of the two big shopping trips. (Our grocery bill is really low each month – maybe $150 a month for three of us – my wife is a master at price matching and we only buy milk and produce, fruit, and veggies). We just rotate out the food so that nothing expires, nothing ticks us off more than wasting money, so we make sure to use food before it expires and we have great tasting normal meals. My wife is a fantastic cook and makes it impossible for me to stay in shape…so I have to run 3 miles a day. I guess I could cut down on portion sizes but it’s just so good! Long-term storage doesn’t mean horrible food. I had MRE’s in scouts. Don’t know what an MRE is? Wow, you are lucky. They are “Meals Ready to Eat” and are used in the military that have a shelf-life of forever basically (and taste like it). We had to eat them on occasion in scouts to teach us a “life lesson.” The lesson I learned is I don’t like MRE’s and don’t want my life to depend on them! You can buy them in weekly, monthly, yearly supplies. I guess some of them taste better now, but to me I’d rather eat dirt and worms. I think the MRE company is going to cancel their sponsorship with me after this article. We also store a lot of bags of flour, sugar, and other food that can be used so my wife can make bread and other things from scratch. She also has hard wheat in metal containers that last forever (or around 30 years) and can be ground up to make flour. We have a grinder that works by electricity or if that is out we can grind it by hand crank…let’s hope the power stays on. We’ve tried ground up wheat before and it is not my favorite, just a little grainy, but it will do in an emergency. My wife knows how to make a bunch of things from scratch…not just from things bought in a box with a recipe at the store. Making food from scratch is an important skill to learn and is being lost over the years. Another must have for food storage…a manual can-opener. If you have an electric can opener and the power is out…good luck opening all those cans. When my grandpa moved out of his house in to a retirement center he was clearing things out and asked if we wanted his freezer. I do love free stuff and we just happened to have bought our current home at the time, so we had room inside the garage for the freezer. My uncle is a doctor and a rancher on the side so we get free meat from his farm (which really helps with the food budget) and then we buy chicken in bulk along with several other items. My wife makes jam and we have rows of that along with butter, bread, cheese and whatever else is hidden away in there….oh yeah, and lots of ice cream! Add all this up and I think we’d do really well if our economic situation changed drastically. We are prepared so if I lose my job I can worry about finding a job and not where our next meal will come from. We don’t have to use our emergency money on food, we already have plenty. Things are hard enough when you lose a job or income emotionally, why add more to the worry list? In my neighborhood we’ve had three families lose jobs in the last two months. Not one of them needed help or asked for help because they had food and money on hand. All of them ended up finding work rather quickly, but in talking with them they all mentioned that they were grateful they had prepared. Two of them knew their jobs were going away and the other got totally blindsided. You just don’t know. We have multiple ways that we store water. The most common thing is to have these large 55-gallon water barrels like the ones shown here. They are full of fresh water with a tiny amount of bleach to help keep it pure. 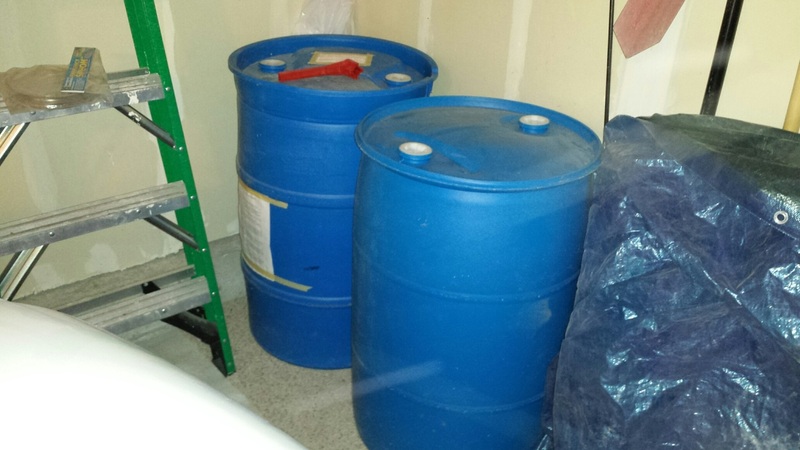 I keep the water covered with a tarp and dark so that the barrels aren’t exposed to the sun. It is recommended to rotate the water every six-months but just last summer I figured I finally better switch it out after four years and decided to test out the water and guess what… STILL ALIVE! It wasn’t too bad and I actually couldn’t tell the difference between the tap water and the barrel water. I even had two glasses for my wife and said “guess which one is the barrel water?” She didn’t want to play. 🙂 However there is a chance in an earthquake I may lose access to the garage or the water could be contaminated or the barrels break so we have smaller 5 gallon water jugs in the basement. Plus have you tried to move 55 gallons of water? Super Heavy! It’s easier to get a 5 year-old out of the candy or toy section of the store than move the water barrels. We do have a hand pump to hook up and get the water out, but we like to have extra water in smaller containers on hand. It came in super handy when we had the latest 24-hour water scare. Small containers are easy to move around and easy to store around the house. I realize this type of planning works best for people with a lot of space. But I also lived in downtown Salt Lake City when I was a TV reporter and had a small apartment that was only accessible by elevator. I obviously couldn’t have giant water barrels or shelves of food in an apartment. But I also didn’t let it be an excuse to not be prepared. The best thing was to have lots of water on hand. I would usually have an empty two liters of pop and would have 5-10 of them in a closet or somewhere under the bed where they weren’t in the way. I also had 72-hour kits of food in a bucket and would just have that on hand. I figure if I can survive on my own for 72-hours I might end up okay or at least hopefully resources would be available at that time or I could make it to my parents’ house. (You can google 72-hour kits; there is a ton of information on how to prepare a kit). I also have 72-hour kits in my car and my wife’s car. They are in backpacks we can grab and go if needed. 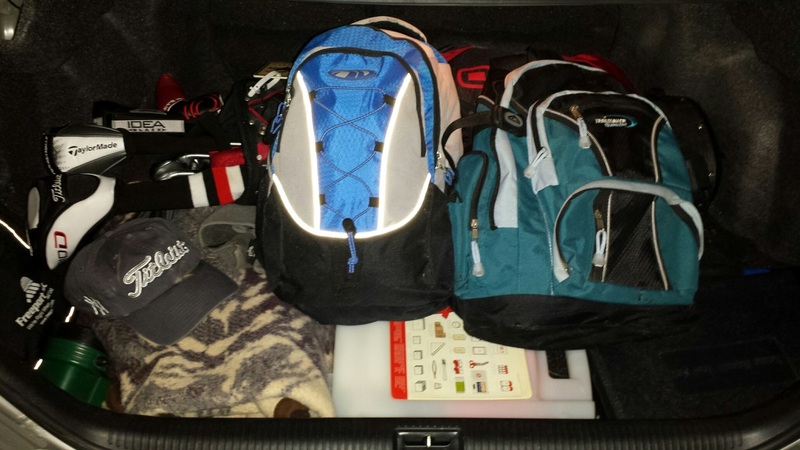 I also have a big flashlight, blankets, and a first-aid kit….and yes my golf clubs…you know you have to save the important and essential things :-). I just like to play golf and work near a course. 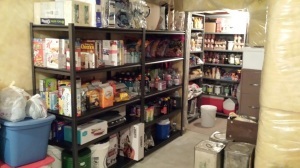 *Note from Laurie: here is a post I wrote on how to stockpile in small spaces. In our backpacks we have water, 72 supply of food (not awesome food, just survivable yucky food) and snack bars and a small amount of cash in small bills. We also have a few pair of clothes, flashlights, lighter, pen, paper…etc. These 72 hour kits need to be updated since the snack bars only last so long and my 5 year old daughter grows leaps and bound each year and needs updated clothes. Again you can’t plan for a disaster and chances are I am going to be at work and away from home. Who knows it might happen tonight or at a football game or maybe riding the Tower of Terror at Disneyland while on vacation, you just don’t know. This is a great post. 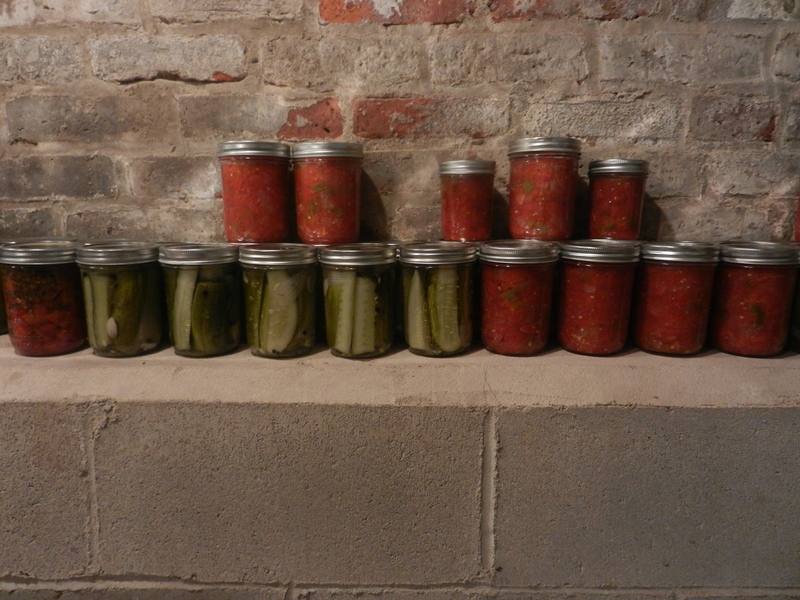 How I see it if you have an emergency fund for emergency, why not a food storage. Like you said, if you lose your job or worst, it will help the stress of worrying where your next meal will come from. Yeah, I’ve never really experienced it personally but had several neighbors including one across the street recently lose their job and asked if we could help out and they all turned me down. You could tell there was some panic in their situation, but they were also at ease at the same time because they were prepared. Luckily all of them got jobs quickly. Thanks Laurie for the opportunity! Like we have commented if you are prepared you shall not fear. No one ever has regrets of being over prepared in life whether food, finances or education. Thanks again! Thanks Kay. Guess what it is trying to do in SLC today…snow! I don’t think we’ll get much but I do like snow before Thanksgiving. I keep meaning to get things moving with stocking up on food and creating some kind of pantry, I’ve been thinking about doing it for ages now. I don’t have a lot of space but after reading how you managed in a small apartment, I don’t really have an excuse! I just need to make room for some clever storage solutions. It definitely pays to be prepared as you never know what might happen. Great post! I didn’t do it at my first apartment and it was a challenge when I had roomates, but my mom showed me a few things and said instead of thinking so big just think small and be prepared for a few days, maybe a week. That was totally doable. Wow this is really impressive Lance! I thought we were good with backup supplies, but you guys are REALLY good. We have lost power a number of times, including 10 days after Hurricane Sandy, so we are all about preparedness. I really do feel as though it is better to be safe than sorry. Wow 10 days is a long time. We have been preparing for earthquakes all the time since we live on a fault line with the Wasatch Mountains but the issues we have had are fires, snow, and water along with job losses. You just never know what will happen. This is great encouragement to store more food! We have some stored in the far to reach cabinet areas but nowhere near the amount you have. It is such a good idea and we will be working on building our stockpile! That is great. I think it is better to build it slowly kind of like a CD ladder. You don’t want everything to expire at the same time, but a little each month so that you use what you buy. Just buy an item or two extra each time you shop and it builds up. Just like saving money. If you can save an extra 1% in to retirement each year it adds up rapidly over time. This is something we really want to start working on. Since we plan on moving soon, that’s our excuse for now for why we aren’t building it up. However, I definitely plan on changing that soon! There is nothing worse than helping a neighbor move out 6 months worth of food or a basement full of holiday decorations! When people move most will try to use down their supply so they don’t take up so much space trying to move so much. Plus you empty your water barrels since those weigh so much as well. Great post Lance! Guess I know who’s house I’m coming to if the apocalypse happens. 🙂 We’ve stored up food before but never this much. 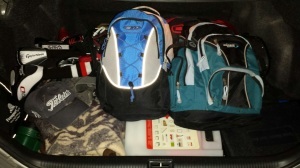 We usually just have a few days worth of stuff we could dig into in an emergency. Sounds good, bring a lawn chair and we’ll watch it together while eating ice cream out of the food storage. In the past I always thought if I could make it to my parents house I would be okay in an emergency, but with my own family now I need to take care of them as well. Honestly I’m more worried about water than anything else. Of course! It is my downfall. Breyers is on sale 3 for $6 and so we bought 6 on Saturday and today my wife texted and asked me to pick up 3 more on the way home from work tonight. She barely even eats it but she works out every morning at 6am with a neighbor who is a trainer so she can eat whatever she wants. Having personally experienced the effects of the ice storm of the century in eastern Ontario and all of Quebec back in 1998 where the province was without power for days, and some citizens as long as 6 weeks as the entire Hydro power grid was brought down, what you state about preparedness is a must. Stocking up on water and food, candles, flashlights, alternate sources of heat etc… may seem ludicrous to many but when a disaster happens, that’s when they’d wish they done much of what you suggested. Wow, 6 weeks is incredible. You never know how you will react until you are in the situation. All you can do is try your best and hopefully keep calm and cool in the situation. This is something I definitely need to approve. I do live in a small apartment so I can’t stock up the way you do, but I can do much better than I am. Like you said, to at least have a week’s supply of food and water can make a huge difference and doesn’t take up an unreasonable amount of space. I’m a big fan of stuff that fits under beds, in closets or backpacks. Just start a little at a time. One extra box of granola bars an extra 2 liter of pop that you refill with water and you are on your way! We have maybe a week’s worth of food on hand. We also were gifted a freezer by a grandparent, and now as we head into what’s supposed to be a bad winter I’m trying to fill it up! That will help improve our level of preparedness. Kudos to you for being so well prepared!! It’s amazing how fast you can fill up a freezer. Also helps that you can buy stuff in bulk and on sale and just put it in there. My wife picked up a new supply of chicken today and had it packed in the freezer to last the next half-year for BBQ’s and everything else. Sometimes you can over think and forget some of the basics. What good is it to have big water barrels if you can get the water out. You can have lots of food but if the electricity goes down do you have a way to cook it? That is where some our camping supplies come in handy with the stove. I also have a plate for my BBQ so I could cook on there as well if needed. We have three grocery stores nearby. Neighbors who went to them an hour after the reverse 911 calls from the city said that they were cleaned out so they drove to the next city and it was gone, people went city to city looking for water. Crazy times. People look at me and my wife live we’re crazy because of our stockpile, but we really just have it for emergencies. Sure, we call it our “zombie apocalypse stockpile”, but if there was ever extremely severe weather or a disaster, it would serve us well during that time too. If they lose a job or there is an emergency they’ll think you are a genius. Nothing wrong being prepared. My neighbors like to buy big camping trailers, trucks and 4-wheelers. I like giant investment portfolios, everyone is different. Wow, Lance, you really have a great food supply! I do stock foods too, but it’s not as much as yours. I should stock more foods too, because we don’t know when the national disaster to come. Lauri and I have discussed this before but it bears repeating. If you are in your own house and can afford it, a whole house generator is great for peace of mind. In our former home we had a portable generator that got us through the aftermath of a tornado that hit 1 mile from our house as well as an ice storm. Power was out for nearly a week each time, and with no fireplace, staying warm in the winter was a huge benefit. In our current home we have a whole house model that comes on 30 seconds after a power disruption. We also have quite a bit of stuff stockpiled although not 6 months worth. We could last a long time. I bought some shelf-stable milk because I don’t like the result of freezing it. So that, along with plenty of toilet paper, keeps us in pretty good shape. Funny, Kath, about the TP. 🙂 So, we haven’t frozen milk before. Does it separate when you thaw it afterward, or what do you not like about freezing milk? Also, do you freeze cheese or butter? Any likes/dislikes about that? We freeze our bread, cheese and butter. Freezing cheese and bread was new to me. My mom doesn’t do that. I don’t like the cheese because it tends to crumble, but usually my wife loads up on it when it goes on sale so we get a good price but it will crumble after being thawed. Doesn’t matter for grilled cheese, but bugs me if I have to try and cut it in slices. The bread can sometimes dry out or have hard spots. Bread isn’t exactly stored in freezer bags and can sometimes get freezer burn. I fix a sandwich everyday for lunch so I go through it quick. But switching bags helps out with it. We do freeze butter and margarine very successfully an block cheese. Not sliced or shredded. I know a lot of people in the prepper and frugal world do freeze milk but I haven’t been successful. I find it separates and even after vigorous shaking, it still doesn’t reconstitute. So we go with the shelf=stable version. I’m always freezing all of my bread, especially gluten free bread. It seems to mold after only a couple of days. This is amazing advice, and something that just recently I’ve started to feel strongly about. While I’m not Mormon, I do really like the principle of being prepared, and the security of knowing that if all hell breaks loose, or the economy crashes, we will still have food and water. I have started creating an emergency supply of food, but would definitely be interested in knowing more of the specifics of how to store different types of food, expiration dates, and more! Gretchen, good for you for beginning your stockpiling lifestyle!! I will put together a post within the next week that talks more about the specifics. How does that sound? I live by a lake so we’re good for water, we can bleach it. We also have a gas tank, which you don’t mention, so we can cook with gas if the power goes out. And 90 acres of trees… But living in the tropics, food spoils quickly. There are lots of animals in my village, I have hens, ducks and turkeys and people are pretty self sufficient regarding meat and corn to make corn tortillas. I think we could live for 3-4 weeks out of the cupboards, another month killing all the animals, but to avoid rats and rackoons I won’t keep more, and now having a big dog his food takes a lot of space in the freezer, which also seems to spoil things quicker than freezers in cold climates. I can freeze fish for a month, after it goes bad, meat 2-3 months top. Pauline, you are in a great situation! I think a lot of homesteaders here have propane tanks or at least gas grills, so that helps with food preparation. You have plenty of water and woods, that’s for sure, and with the abundance of wild animals there, I’ll bet you could last longer than you think.